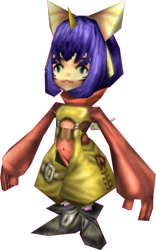 Eiko is one of the eight main playable characters of Final Fantasy IX. Eiko is a young summoner from Madain Sari and as such has a horn poking through her bangs, as all summoners do. Eiko is young but despite being isolated to Madain Sari and Conde Petie for her entire life, has a very worldly attitude. Many of her thoughts of how people are expected to act - most specifically, her thoughts involving love - were shaped by plays by Lord Avon, the bard. Her crush on Zidane is, as a result, overly complicated and romantic and goes right over Zidane's head. Eiko can be rather blunt with many of the characters, specifically uncertain people like Vivi, but by being so confident as such a young girl, she inspires many characters to be a bit more certain about themselves. Eiko is a magical character in battle and, like Garnet, is both a White Mage and a Summoner. She fights with rods and racquets while equipping robes, light armor, and light headgear. 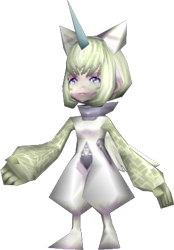 Eiko has much stronger White Magic than Garnet, with the ability to cast Holy, but her summons are generally weaker or status-based. When Eiko enters Trance, her hair and dress turn white and both her horn and angel wing ornament get significantly larger. Her White Magic command changes into Double White, which allows him to cast two White Magic spells consecutively. There's no associated MP discount with this, and each spell decreases the Trance gauge separately, but the amount of the gauge used up per spell cast is less than most characters use for a normal Trance command.